There’s something for everyone in version 10 of the Mac’s most popular database management program, FileMaker Pro, and its big brother, FileMaker Pro Advanced. Developers can now be more responsive to user actions, while users can now customize certain aspects of the database without having to call in a developer. FileMaker comes in two editions, standard Pro and Pro Advanced. The latter has everything the standard edition has, with a few useful extras. Both versions can be used actively and passively—that is, developers can create and build new databases in either program, and end users can use either program to open an existing database, enter a new record, find a contact’s phone number, print out this week’s purchase orders, and so on. FileMaker Pro Advanced provides a handful of utilities that developers will find very useful, including a script debugger a custom function editor, and the ability to create single-user standalone versions of databases. But the term “advanced” is somewhat misleading. For one thing, there is no FileMaker basic—that is, no thin-client version of FileMaker that can be used to open and use shared databases, but not to create them. Professional developers using FileMaker Pro on a secretary’s computer can do very nearly everything they could do on their own computers using FileMaker Pro Advanced. And since the two programs work identically, standard FileMaker Pro is no harder to use than FileMaker Pro Advanced; in fact, the developer-oriented troubleshooting utilities available only in Advanced make solving problems easier. That is why users who spend much of their time in FileMaker working as developers rather than end users will want to use the Advanced version. Nearly all of the features new in FileMaker 10 are shared between FileMaker’s two editions, so the features discussed in this review apply equally to both. FileMaker has also released new versions of FileMaker Server and Server Advanced, but I did not test the server products for this review. The status toolbar combines functions of the old status area and the old toolbar. Notice the Saved Finds button in the browse mode toolbar. The most obvious (if not the most significant) change in the new version of FileMaker is the new status toolbar, which replaces both FileMaker’s old toolbar and the old status area on the left side of the window. The new status toolbar appears across the top of the active window, like the button bars in your Web browser. The status toolbar has a contemporary look, and you can even customize it by adding or removing buttons, much the way you can customize your browser’s toolbar. The status toolbar lets you see longer layout names in the layouts menu, and makes room for more buttons. But to do so, it has to occupy more space on screen—and worse, it takes up space at the top of the display, which is more valuable than space at the sides. (Screens are getting wider faster than they’re getting taller.) Perhaps new users will take it in stride. For experienced users, the new status area takes some getting used to. There’s more good news in FileMaker Pro 10 for non-developers than in any release in a long time. Ordinary users will now be able to save commonly used finds and execute them as many times as they want. This is especially useful because users’ finds are saved on their own computers—so an accountant’s saved finds can be different from a sales rep’s, for example. You can access saved finds via the new status area, or via a menu. Table view has also gotten much more useful in this version. It’s long been possible for you to resize or move columns, but now users may also decide which fields are displayed on screen, just as you can hide columns in Excel. This means that you can customize your own views of your data, even if you don’t have the privileges required to edit layouts or scripts. When you sort records in Browse (record-editing) mode, they now stay sorted. If you add a new record, it moves into its proper place in the sort order as soon as the record is saved. This is great. Even better, it’s now possible to view subsummary reports in browse mode. To get subtotals in previous versions of FileMaker Pro—for example, to see sales totals by sales rep—you had to enter FileMaker’s non-editable print preview mode. Now, in my billing database, I can keep track of totals in and out for each month, even while I’m adding and editing records. In FileMaker Pro 10, you can generate a report with subtotals simply by sorting the records. You can view the subtotals while you continue to edit. 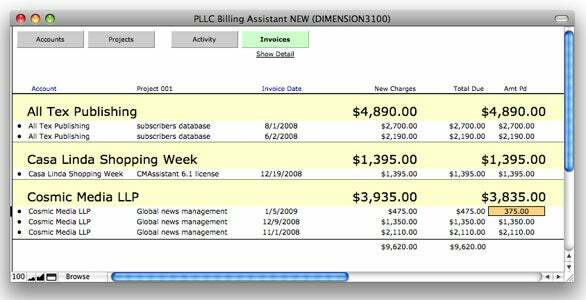 FileMaker has long been able to import data from Excel spreadsheets and create tables on the fly, but many users apparently never realized this. Now, when you create a new database, the option to base the database on an Excel spreadsheet or even a text file is hard to miss. Mac OS X users can also now base new FileMaker Pro databases on a Bento 2 data source or library, so you can very quickly get contacts from your Address Book into FileMaker Pro. And if you want to build a new database, but you don’t want to start absolutely from scratch, FileMaker Pro 10 comes with a number of new and more sophisticated starter databases. FileMaker remains primarily a desktop application, but the desktop these days interacts extensively with the Internet, and FileMaker 10 further blurs the distinction. FileMaker 9 added a Web viewer that allowed you to bypass your browser and view Web pages directly on a database layout. FileMaker 10 carries this a step further. You can now bypass your desktop e-mail client completely and generate and send e-mail messages directly from FileMaker 10 by configuring FileMaker to pass data to your SMTP server. (This was possible in the past but required a commercial plug-in.) So it’s now easy to generate and e-mail reports, bills, thank you letters, or any information contained in your FileMaker database. FileMaker Pro 10 remedies a problem in setting tab order that has annoyed both professional developers and do-it-yourselfers forever. Now, when you insert a new field on a layout and add it to the tab order at, say, position #8, the field that had been #8 becomes #9, the former #9 becomes #10, and so on. The way it used to work was too ugly to remember. For professional developers, however, the most exciting news in FileMaker Pro 10 is the addition of script triggers. In FileMaker Pro, scripts are little programming units that can be used to perform all sorts of tasks. For example, a script can manage every aspect of a report: it can ask users for input, find records, recalculate record totals, go to a layout, sort records, and print. In earlier versions of FileMaker Pro, scripts almost always had to be triggered manually—that is, users had to kick-start a script by clicking a button or selecting a script from a menu. This was fine a lot of the time, but for years, developers wished they could run scripts automatically in response to common user actions. Now, instead of relying on end-users to do things they might not do, like click buttons or select scripts from the menus, the developer can identify nearly all of the most basic user actions—such as entering or exiting a field, selecting or saving a record, or going to a new layout—and run a script automatically when one or more of those actions occur. Script triggers have long been available in other more industrial-strength database programs like 4D. The appearance of script triggers in FileMaker Pro is further proof that FileMaker, while easy to use for Christmas lists and recipes, is also a powerful development platform for business applications. One caveat: Although available in the standard edition of FileMaker Pro, script triggers are a fairly advanced feature. Sound use of script triggers requires careful planning. If you use a script trigger to calculate a record total, you need to make sure that the trigger can’t be circumvented if, for example, the user modifies the record on a different layout. In addition, standalone runtimes created by FileMaker Pro Advanced are single-user only, and lack the PDF-creation capability available when databases are opened in the full copy of FileMaker Pro. Saved finds, dynamic summary reports, and script triggers make FileMaker Pro 10 a very desirable upgrade for current users. And if you remember the pain of upgrading from versions 6 to 7, panic not: the format of FileMaker Pro 10 databases has not changed (it’s still .fp7), so upgrading is painless. You can even upgrade your workgroup a few machines at a time. Of course, if a database is designed to use some of FileMaker Pro 10’s new features, they won’t be available if the database is opened in the previous version. On the other hand, if you are not already a FileMaker Pro user and you’ve had the feeling that Excel or Bento are holding you back, you should definitely give this new version a careful look.